Just after the 10km mark we ran past the most famous bathtub in Iceland, the memorial sitting silently by the roadside with a sign telling the incredible survival story it played a part in. I would have liked to stop, but we were busy making our way up a steep hill up to the highest point of the course, behind the volcano Eldfell that erupted in 1973. We were supposed to be running 30km that day in preparation for a fall marathon. However, when my brother called with the idea of taking the two hour car and boat trip to the Westman Islands to take part in a very hilly half-marathon, of course we couldn’t resist the temptation. Vestmannaeyjar or the Westman Islands are a group of 15 islands in addition to a number of rocks and skerries that make up the archipelago. The largest island is Heimaey where 4,100 people live but the other islands are uninhabited. In 1973 there was a volcanic eruption on Heimaey. Almost the whole population of the island was evacuated overnight to safety on the mainland, mostly by fishing boats. The island has a lot to offer and plenty of interesting things to see, including the museum Eldheimar (Pompei of the North) which focuses on the 1973 volcanic eruption. Vestmannaeyjar is a fishing village so enjoying a meal of freshly caught fish is a must while visiting. The race has three distances on offer, a 5K, 10K and a half marathon. As the island is only 13.4 km2, the half marathon pretty much takes you all around it. The route is on asphalt roads with a few very short parts on trails. The race organizers are not trying to put on the fastest race and flattest course possible. Some might even suspect they are trying exactly the opposite! However, the emphasis is on creating a course that shows the amazing beauty of the Heimaey island. 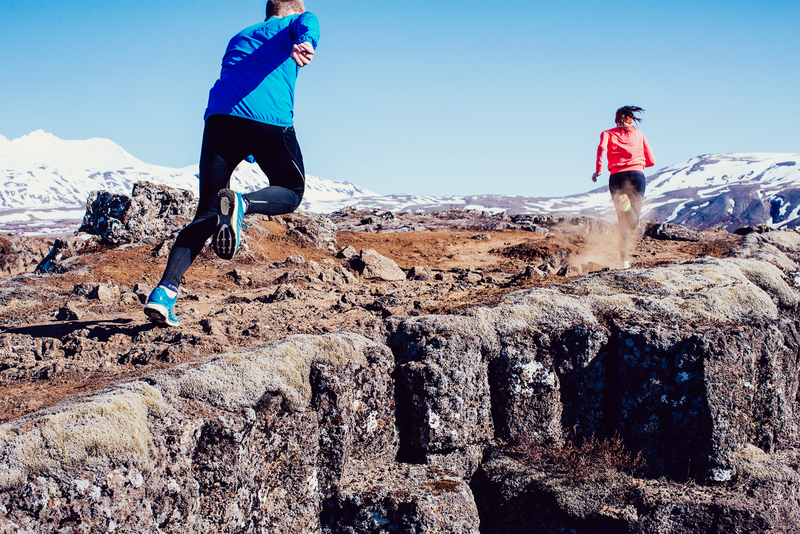 During your run you will find lively bird life, including puffins watching over you from the cliffs, see heaps of sheep, and enjoy the smell of freshly caught fish at the harbor. The landscape is spectacular and varied as you run through the green Herjolfsdalur valley, past a golf course, around the Eldfell (Fire Mountain) volcano and through the lava that enlarged the island and destroyed half of the town in 1973. There are many hills, so expect to run a half marathon 3-5 minutes slower than your best. The bathtub? It’s a memorial to the extraordinary feat of Gudlaugur Fridthorsson and the tragic events where four fishermen lost their lives. It is one of many sights worth seeing on Heimaey after the race. The finish line is at the sports center where it is customary to soak in the hot tub and have a dip or two into the ice bath at the excellent local swimming pool. It is also a great place to analyze your race and have a chat with your fellow runners and the very friendly islanders. This was our first run in the Westman Islands and we had a great time. We will be back! You can register for the 2017 race now. See you there! Absolutely! It is a full days trip, and you will not set a PB, but we had luck with the weather and it was a great day for us. Thanks! That’s great advice, I run for fun anyway, not the PBs! Any others you’d recommend? Can anyone tell me what day the Westman Island Half Marathon will be held in 2019? I would like to plan a vacation around it. Hi Melissa, the race is on the 7th Sept. 2019. See you there !